Adducins are heteromeric proteins composed of different subunits referred to as adducin alpha, beta and gamma. The three subunits are encoded by distinct genes and belong to a family of membrane skeletal proteins involved in the assembly of spectrin-actin network in erythrocytes and at sites of cell-cell contact in epithelial tissues. Adducin, originally purified from human erythrocytes, was found to be a heterodimer of adducins alpha and beta. Polymorphisms resulting in amino acid substitutions in these two subunits have been associated with the regulation of blood pressure in an animal model of hypertension. Structurally, each subunit is comprised of two distinct domains. The amino-terminal region is protease resistant and globular in shape, while the carboxy-terminal region is protease sensitive. The latter contains multiple phosphorylation sites for protein kinase C, the binding site for calmodulin, and is required for association with spectrin and actin. Adducins are heteromeric proteins composed of different subunits referred to as adducin alpha, beta and gamma. The three subunits are encoded by distinct genes and belong to a family of membrane skeletal proteins involved in the assembly of spectrin-actin network in erythrocytes and at sites of cell-cell contact in epithelial tissues. 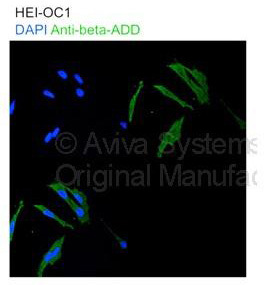 While adducins alpha and gamma are ubiquitously expressed, the expression of adducin beta is restricted to brain and hematopoietic tissues. 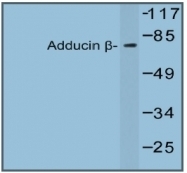 Adducin, originally purified from human erythrocytes, was found to be a heterodimer of adducins alpha and beta. Polymorphisms resulting in amino acid substitutions in these two subunits have been associated with the regulation of blood pressure in an animal model of hypertension. Heterodimers consisting of alpha and gamma subunits have also been described. Structurally, each subunit is comprised of two distinct domains. The amino-terminal region is protease resistant and globular in shape, while the carboxy-terminal region is protease sensitive. The latter contains multiple phosphorylation sites for protein kinase C, the binding site for calmodulin, and is required for association with spectrin and actin. Various adducin beta mRNAs, alternatively spliced at 3\'end and/or internally spliced and encoding different isoforms, have been described. The functions of all the different isoforms are not known. 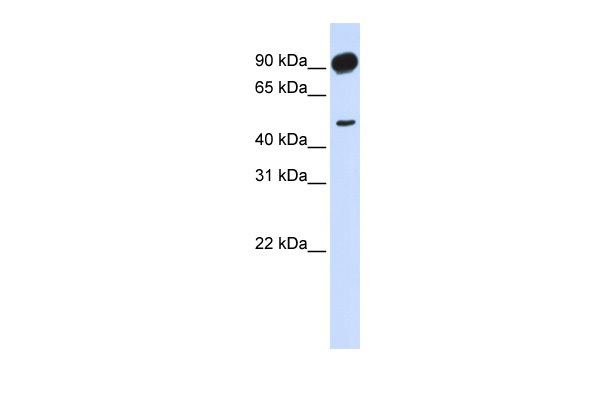 Western Blot analysis of ADD2 expression in transfected 293T cell line (H00000119-T02) by ADD2 MaxPab polyclonal antibody.Lane 1: ADD2 transfected lysate(79.86 KDa).Lane 2: Non-transfected lysate. Western Blot analysis of ADD2 expression in transfected 293T cell line (H00000119-T02) by ADD2 MaxPab polyclonal antibody.Lane 1: ADD2 transfected lysate(80.80 KDa).Lane 2: Non-transfected lysate. 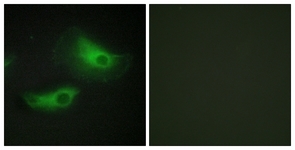 Western blot analysis of Beta-Adducin Antibody (Cat.-No AP20545PU-N) at 1/500 dilution. Lane 1: HEK293T whole cell lysate. Lane 2: Raw264.7 whole cell lysate. Lane 3: Rat spleen tissue lysate. 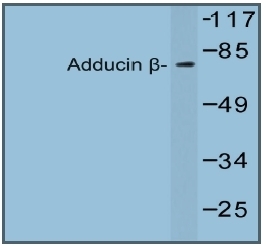 Western blot analysis of Beta-Adducin Antibody (Cat.-No AP20545PU-N) in extracts from 293 cells. 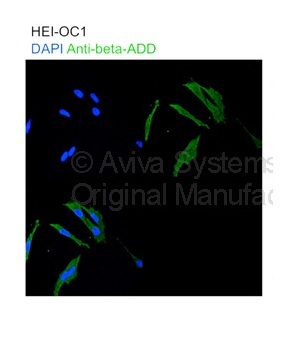 Immunofluorescence analysis of HeLa cells, using ADD2 Antibody. The picture on the right is treated with the synthesized peptide. 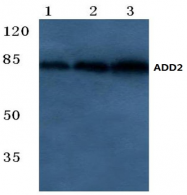 Western blot analysis of extracts from 293 cells, using ADD2 Antibody. The lane on the right is treated with the synthesized peptide.